← Bob’s Red Mill Giveaway Winners! I can’t believe that it’s been over three months since I’ve baked anything with chocolate. How could I have let that happen? To remedy this dire situation, I adapted my Fig, Almond Frangipane, and Orange Tart to make this nutty tart. I recently received a complimentary bag of hazelnut flour from Bob’s Red Mill to try out, so I took this opportunity to use it in both the crust and the frangipane. I had added orange zest and extract in the fig tart and I kept them in this one as well since I absolutely love the combination of orange and hazelnut together. The citrusy tart shell paired very well with the two layers of fillings – hazelnut cream and the dark chocolate ganache. I love how smooth the slightly warm ganache was as I poured it on top of the cooled frangipane. It seemed to take forever for the tart to set, as I waited impatiently with a glass of milk. I love discovering new ingredients such as the hazelnut flour I used in this recipe. It is so convenient, eliminating the hassle of skinning and grinding hazelnuts. It has a fresh and nutty flavor, and I’m really looking forward to finding more uses for it, perhaps in savory dishes as breading for pork chops or chicken, as well as in cookies, breads, and pastries. As you may have noticed, I have shared a few recipes using ingredients from Bob’s Red Mill: Blueberry Corn Muffins, Creamy Herbed Polenta, and this tart. I am extremely happy with the way all these recipes have turned out, due in part to the high-quality products from Bob’s Red Mill. I enjoy using their products, so I’m having a another giveaway sponsored by Bob’s Red Mill. Three (3) winners will each receive one (1) bag of Polenta (gluten-free or regular) AND one (1) bag of Hazelnut Flour directly from Bob’s Red Mill. Giveaway ends Friday, August 10, 2012, 11:59 pm PDT. Winners will be announced on Saturday, August 11, by 10 am. To enter, simply Leave a Comment telling me about your favorite recipe using Polenta or Hazelnut as an ingredient. You can leave more than one comment, but only your first comment will be counted as a giveaway entry. Three winners will be picked at random from all those who enter. Winners will have one (1) week from announcement to email me contact information and mailing address, which I will forward to Bob’s Red Mill for product fulfillment. Giveaway is open to residents of the US and Canada, 18 years and older. Note: Bob’s Red Mill provided me with the product to review and the products for the giveaway. (Product Review Disclaimer). For the tart shell. In a medium-sized ovenproof bowl, combine the butter, orange zest and extract, oil, water, sugar, and salt. Cook until the butter is bubbling and starts to brown just around the edges, approximately 15 minutes. When butter has browned, remove the bowl from oven and carefully add all the flour and stir quickly until the dough comes together and forms a ball at the center of the bowl. To assemble the tart. Lower the oven temperature to 350 degrees. Fill the partially baked tart shell about halfway with the hazelnut frangipane. Bake the tart until the frangipane has become firm and golden on the outside, about 10-15 minutes. Cool completely. 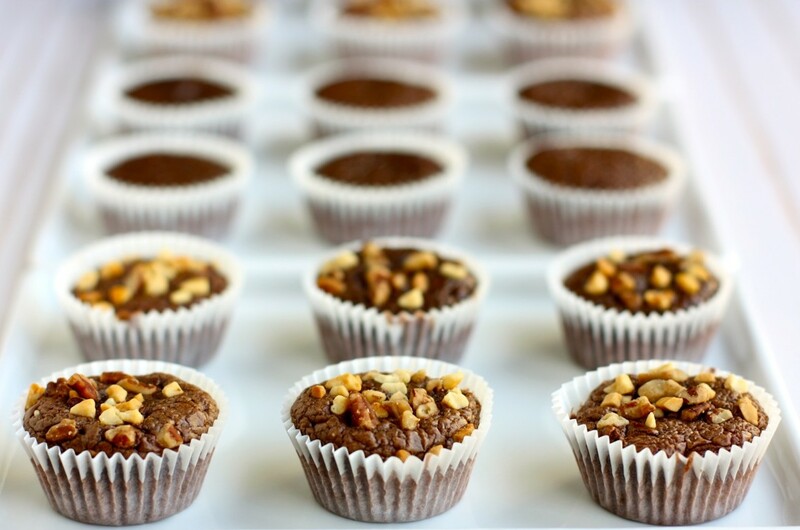 Once cooled, pour the Nutella-Dark Chocolate Ganache and garnish with chopped hazelnuts. Tart shell adapted from Paule Caillet (courtesy of David Lebovitz blog) and frangipane adapted from Dessert First Girl. I love nutella and I’m always looking for new ways to use it, can’t wait to try this! I love to make polenta, let it cool, and then use as the “crust” for a quiche! Love bob’s products!! Are you kidding me?? That looks so good its just mean. Im not the best baker and that looks amazing amazing. Your making everyones mouth drooooool. Awesome giveaway-I love Bob’s Red Mill! My favorite way to prepare polenta is soft, with lots of cheese, and then pile on roasted veggies and a fried egg on top. Hazelnut Pull-a-part Bread! Hands down amazing! Breads of any kind are just amazing anyways! My favorite recipe with hazelnuts is hazelnut brownies. My favorite using hazelnuts is a chocolate peanut butter and banana smoothie. I not only use fresh hazelnuts and rolled oats from Bob, but also use Justin’s chocolate hazelnut spread for good measure! Mmm! Simple and great for summer heat. I absolutely love hazelnuts, I think they are the most unique tasting nut. I like to pound them down to pieces and use them in my homemade granola, with a ton of cinnamon and dark maple syrup. Delicious! I love using ground hazelnuts or premade hazelnut flour to make macaron shells (instead of ground almonds). Perfect especially with Nutella filling! I use hazelnut flour mixed with powdered sugar and melted butter to make a nut filling for St. Martin’s Day crescents sometimes. I alternate between almond and hazelnut. This recipe looks delicious! I can’t wait to try it. Thank you. I love Polenta! I eat it two ways, one I cook it in broth and just sprinkle a good cheese. The other one I do the same, put it in a baking dish, top with tomato sauce and mozzarella, put it in the oven until cheese is melted. I actually like to eat Polenta for breakfast also. I put sugar, milk and cinnamon over it and eat it like that. Love it! My favorite polenta recipe includes a touch of butter and cream. We enjoy the polenta paired with a quick stir fry of baby broccoli with garlic. Daisy, what a glorious recipe. I really like the use of orange extract in the crust and the fact that this is a hazelnut frangipane, rather than the traditional almond. It must complement the nutella in the ganache beautifully. I’m not local but maybe if I win my sister can reap the rewards? With the hazelnut flour I’d make a classic linzer torte. My favorite thing to with polenta is to serve it with a rich duck or rabbit ragu, with shavings of aged parmesan. Yum! I love polenta with ratatouille! What gorgeous photos!! Hmmmm. I like pan fried creamy polenta cakes served with a ragu of some sort. I don’t use hazelnuts nearly enough but I really love when they’re paired with chocolate. Or toasted on top of salads. How absolutely gorgeous. It looks almost too beautiful to eat! (Almost.) My favorite hazelnut recipe lately is a buttery little tea cookie: http://emmycooks.com/2012/03/24/hazelnut-tea-cookies/. I bet the hazelnut flour would be great in these! I’m going to have to look for some of that flour. What a great-looking tart! My family loves to have Nutella on a toasted English muffin for breakfast. I put it on fancy crackers with a glass of wine to serve as a nosh when we have dinner parties. Sometimes I even eat it on its own! This tart looks delicious. I have not used either, but these recipes are making me want to try them both! I would love to try hazelnut flour! And of course the creamy polenta is already on my list of things to make! As for my favorite Hazelnut thing to make…I absolutely love making a chocolate molten cake with a hazelnut filling. Either served warm or room temperature, the cake oozes the hazelnut filling. It’s to die for! 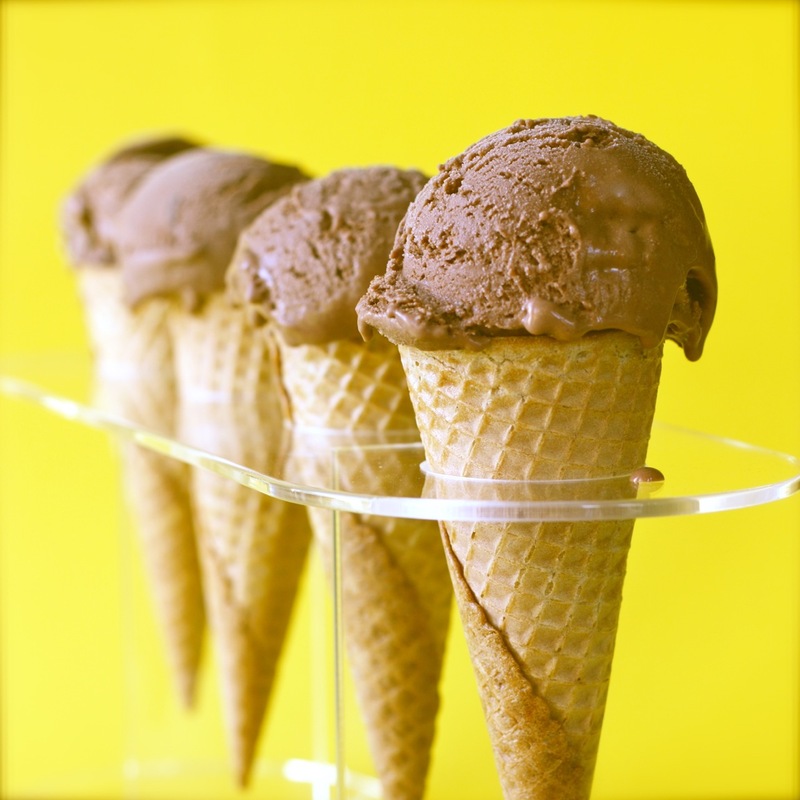 Hazelnuts and dark chocolate, a marriage made in heaven. I love Bob’s Redmill Almond flour, makes the best macarons!! But this tart looks beautiful. I’d love to win the hazelnut flour, I can imagine the many things I could make with this! I have an awesome recipe for a chocolate-hazelnut jelly roll, with hazelnut liqueur. YUM!! It would have to be dark chocolate hazelnut bark. I’d love to try hazelnut flour! I’ve read about this flour before. I would love to use it in my chocolate chip cookies! Your tart looks out-of this-world delicious, Daisy! I love the ganache!! That tart looks seriously amazing! 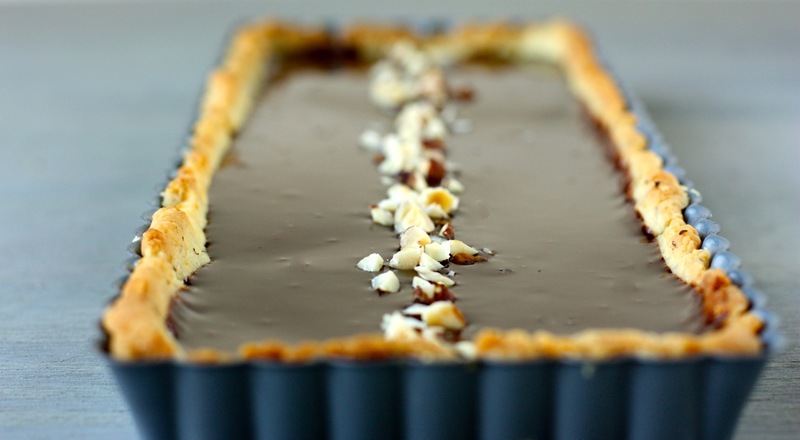 I think the best thing to do with hazelnuts is simply to cover them in chocolate… amazing. I’m in love with this tart, it looks so good! There are two things I like to do with polenta. The first is to grill it and have a black bean and corn salsa with some cheese on top for my main dish. And, the second is to make it creamy and buttery and add some chives/scallions and a little bit of cheese to it to be a side dish. This looks amaaaaaaaaazing. 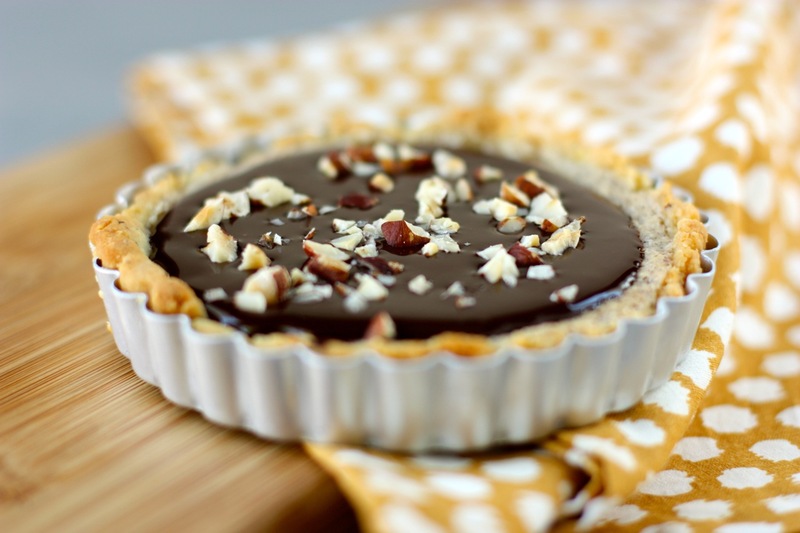 My sister is an absolute chocoholic, and loves chocolate-hazelnut anything, so I might just have to make this for her. My favorite hazelnut thing I’ve ever made is Suzanne Goin’s hazelnut-brown butter cake. I still dream about it. With polenta, I usually keep it simple–there’s nothing better than a heap of creamy polenta with sauteed mushrooms and sausage on top. You had me at the title, Daisy — I know I’d like this. My favorite use of polenta is as a breakfast cereal — I cook a quarter cup of it in a cup of milk, add whole almonds and a splash of vanilla and eat it stirred over a fresh chopped peach or a bowl of berries. I eat it all summer. But when I win the giveaway I can try it with hazelnut flour in it!